With economic study not expected till March 2011, proponents focus efforts on voter registration and education. On a day when the outside temperatures reached record breaking highs, the air inside the East Los Angeles Community Service Center was heated for a different reason as residents gathered for a town hall meeting on cityhood. While a vote on the issue of cityhood is not yet a done deal, with several steps still to be completed, including getting a determination of financial viability, the overall tone of the town hall was focused on when the vote comes, not if. The town hall on Monday provided residents on both sides of the issue an opportunity to voice their concerns not only with the effort to turn unincorporated East Los Angeles into a city, but also to voice frustrations with living under what many say is an unresponsive county government. Numerous references were made to recent events in the nearby city of Bell where eight current and former public officials have been charged with excessive abuse of public funds. For opponents of cityhood, the scandal in Bell represents the clearest example of what can go wrong if local elected officials are brought in to run an area that has a large immigrant community. On the other hand, proponents of cityhood see the Bell scandal as an example of the need for transparency in local government. Something many believe does not exist with the County Board of Supervisors. Though some residents question whether East Los Angeles has the economic foundation to operate as an independent city, citing the lack of “big box” businesses and other industry, most in the audience of approximately 150 appeared to favor the effort. Organized by the East Los Angeles Residents Association (ELARA), the town hall featured a panel of local elected officials and representatives from each entity directly involved in the cityhood process. The panel included cityhood supporters, State Sen. Gloria Romero and Assemblyman Charles Calderon, who served as moderators by reading questions submitted from audience members. ELARA, a nonprofit created in 2007 to deliver cityhood, was represented by its president, Ben Cardenas. The panel also featured two senior members of Los Angles Local Agency Formation Commission (LAFCO), the County agency that oversees issues such as changes in local governmental boundaries and the incorporation of cities. LAFCO is also charged with putting together a comprehensive fiscal analysis (CFA) to determine whether unincorporated East L.A. would be financially viable as a city and able to provide at least the same level of services that residents currently receive. Jerry Gladback, chair of LAFCO and June D. Savala, deputy executive director of LAFCO were joined by Dorothea Park, a manager for the County Chief Executive’s Office, to provide residents with answers to questions on the cityhood process. ELARA organized the town hall to update local residents on the cityhood legislative process, and to provide a forum to discuss the benefits they believe cityhood could bring to the unincorporated area. Both Romero and Calderon were consistent in their support for cityhood, which they say will give East L.A.’s 140,000 residents the “political muscle” needed to ensure that basic everyday quality-of-life issues are met in a timely matter. For them, cityhood is about bringing government closer to the people. Almost every answer to questions on how cityhood would impact local business owners, home owners, public safety and education featured some reference to the benefits of having a local elected city council to act on behalf of residents. 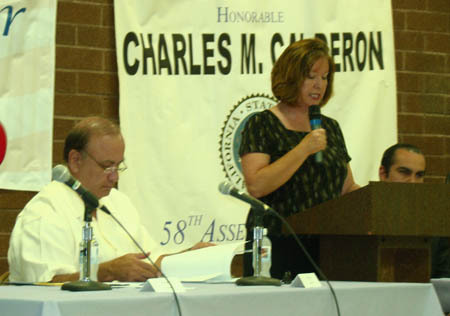 Calderon repeatedly told the audience that local government agencies — such as the Los Angeles County Sheriff’s Department, the Los Angeles County Metropolitan Transportation Authority (METRO) and both the Los Angeles Unified School District and Montebello Unified School Districts that oversee local public schools in the area — would be more responsive to a city council. “Chances are that opportunities are going to be magnified by having elected leaders closer to you,” Romero told the audience. Calderon said the cityhood question should be an easy one for residents to answer. “If your satisfied [with the current representation], don’t vote [for cityhood],” he said. “If you want change, take a look at cityhood. Romero stressed that cityhood would benefit East Los Angeles because it would provide direct access to elected officials who live closer to them. She said under the current structure Supervisor Gloria Molina is the only local elected official for the area. Romero said that Molina and the rest of the supervisors on average represent over 2.5 million residents. In comparison, Romero represents approximately 850,000 residents in her state senate district and Calderon has 550,000 residents within his state assembly district. Romero said that a city would most likely feature a city council with five elected members, with each representing approximately 28,000 residents. In regards to the Comprehensive Fiscal Analysis or CFA, Savala informed the residents that LAFCO is currently collecting data from the county from the 2009-2010 fiscal year that ended on June 30. LAFO expects to release the CFA in March 2011. The CFA will be posted online on the LAFCO Web site and will also be available in a hardcopy format. Once the study is released, the public will have one month to submit comments on the CFA findings. Once the CFA is completed and the County Board of Supervisors reviews it, a determination could be made to allow residents to vote on the issue, possibly as soon as November 2011 or March 2012. If approved, East Los Angeles would officially become a city on July 1, 2012. I don’t know if we are going to get to vote because the study might show how bad the economy is in East LA. A lot of businesses are closing and a lot of people don’t have jobs. Its going to be hard to pay for things and I don’t want any more taxes.